no number 1. Lonsdale - from Corelli, "Come, we that love the Lord"
2. Psalm 23OV - Thomas Clark, "My Shepherd is the living Lord"
3. Psalm 109NV - Phocion Henley, "0 God, whose former mercies make"
4. Anthem - ms sources, "1 will arise"
7. Anthem from Psalm 18 - William Knapp, "In my trouble 1 called upon the Lord"
10. Psalm 42NV - Colby mss, "As pants the hart for cooling streams"
12. Anthem from Psalm 5 - ms book, "My voice shalt thou hear in the morning"
13. 1Cor.11 para I Watts - Colby ms, "'Twas on that dark, that doleful night"
14. Psalm 21NV - ms sources, "The king, 0 Lord, with songs of praise"
16. Anthem from Psalm 26 - Taggart ms, "I'll wash my hands in innocency"
17. Psalm 69NV - John Miles, "Save me, 0 God"
18. Anthem from Psalm 46 - Francis Roads, "God is our hope and strength"
19. Carol - anon, "The holly and the ivy"
20. Carol - anon, West country ms book, "Arise and hail the glorious star"
The CD costs £8 + £1 p&p from Brian Stewart, 24 Spring Park Road, Shirley, Croydon, CR0 5ED. For more details email (Replace -AT- with @ before posting). 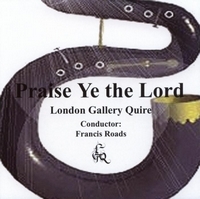 This CD has been released to coincide with the 10th anniversary of the founding of the Quire by Francis Roads. Each Quire has its own characteristics, and the hallmark of this one, as evidenced on this disc, is its stylish instrumental playing, its musicality and clear diction, all of which are noticeable throughout the twenty tunes in the collection. The early pieces are a mix of well known West Gallery favourites. One that is not so familiar is the minor key tune written by Phocion Henley (Rector of LGQ's onetime rehearsal venue, the church of St Andrew by the Wardrobe). These set the scene for the rest of the programme: a good variety of tracks offering anthems, canticles, tunes from the Manx tradition as well as modern compositions in the West Gallery style composed by Francis Roads and John Miles, the Quire's assistant conductor. The early pieces on the album illustrate the importance which the conductor attaches to the musicality and diction already mentioned. It is particularly noticeable in the anthem "I will Arise" - found in many manuscript sources as well as being sung in Sheffield pubs as part of the caroling tradition there. Here the singers, including an impressive soloist, really set their stall out, with effective changes in pace and a dramatic pause for effect before the final phrase. This seems to me to convey a great part of the appeal of West Gallery music - the ability of singers and instrumentalists to make a tune their own" after having received it from some singing "master" as must have happened so often in the past. We are shown this too in the Samuel Webbe tune, Praise Ye the Lord, regarded by many as the LGQ theme tune - hence the album's title! Here the brisk pace, attack and relish with which the tune is sung, pay tribute to composer and Quire alike. These traits are also visible in the William Knapp anthem which follows. This is a more complex piece, typical of Knapp's writing, with many opportunities for word painting and a great fuguing section as well as a thunderous ending which is done full justice here.